Authentic case bought from the Gucci online store for about $300 new. Selling this used case since I got a new iPhone. Free shipping! Gucci Case For Iphone 7 Plus 8 Plus With Logo Bee. Condition is New. Shipped with USPS First Class Package. GUCCI GG Supreme St. Blooms Placed Ebony iPhone 7/8 PLUS Case - GORGEOUS! 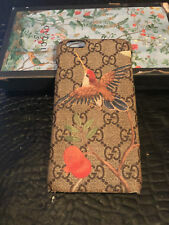 GUCCI PINK, RED, GREEN, BEIGE & BROWN BLOOMS IPHONE CASE, 7 PLUS - AUTHENTIC! Authentic Gucci pink & green Blooms phone case for iPhone 7 Plus. It is pre-owned with a little wear on the edges, primarily on the bottom corners. There is still lots of life left in this fun Gucci Blooms phone case! 100% AUTHENTIC Gucci Blooms iPhone 7/8 Plus Phone Case Cover ECU, includes box. Gucci 100% biodegradable bioplastic iPhone 6/7 Plus case. Excellent Preowned Condition. Signs of use (nicks & scratches). Review all pics. Fits 5.5 screen. 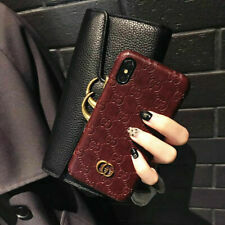 Gucci Case For 7 Plus 8 Plas With Logo Cardholder. Condition is New. Shipped with USPS First Class Package. Upgraded to new phone so no longer need this. It is 100% authentic comes with original box and bag. Used for about 7 months, it does have signs of normal wear. gucci phone case iphone 7 plus. Condition is Used. Shipped with USPS First Class Package. GG Iphone 7 8 Plus Case Cover. Material: GG Plus Coating Canvas. It's a Pre-owned, Secondhand and Original item from Gucci. Condition Rank: Outside SA / Inside SA. B: Generally Secondhand item which is more noticeable scratches or/and stains than A rank.